Iowa's Alaric Jackson (77) and coach Kirk Ferentz smile and congratulate the defense after Anthony Nelson recovered a fumble in the end zone during a win over Maryland last season. 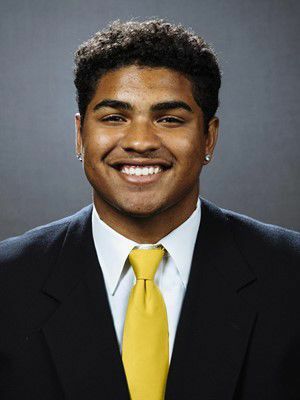 IOWA CITY – Tristan Wirfs gets it. The Iowa offensive tackle understands what coach Kirk Ferentz was suggesting a couple of weeks ago when he said while he appreciated Wirfs’ record-setting work in the weight room he would prefer to see the junior move defenders around with similar ease. Offensive line coach Tim Polasek wants a collection of starters across the Hawkeye front five who are capable of making life more than uncomfortable for opposing defenders. “We’re trying to get a guy’s soul, make him move off the spot where he wants to be and we’re getting better at getting that done,’’ Polasek said. The Hawkeyes’ offensive line coach views his position group, including third-year starting juniors Alaric Jackson and Wirfs, as a work in progress. “I’m not sure we will ever be satisfied, but I know we are going to keep working to get to that point,’’ Polasek said. Collectively, the Hawkeyes are working to help facilitate a run game looking to grow its average yards per carry from the 3.9 Iowa finished with a year ago to the 4.5 Iowa coaches consider acceptable. Reaching that point involves further development with repetition of technique as the Hawkeyes near the midpoint of their 15 spring practices. Banwart began spring drills at the top of the depth chart at center, a position where Iowa will have its third starter in as many seasons and where redshirt freshman Tyler Linderbaum remains in the mix. Polasek said Linderbaum continues to impress coaches with how quickly he has picked up the position since first moving there from the defensive line during December practices prior to the Outback Bowl. Competition continues at both guard spots, where Banwart, senior twins Levi and Landan Paulsen and sophomore Mark Kallenberger are getting a look this spring. Kallenberger is shuttling between guard and tackle this spring in part because Landen Paulsen misses Tuesday and Thursday workouts because of a class. “Mark is being given a really good opportunity this spring and it’s kind of up to Mark what he does with it,’’ Polasek said, saying ultimately the Hawkeyes’ starting front five will be the five players who block and compete with the greatest consistency. For every Hawkeye lineman, that work started in the weight room where Wirfs erased the existing Hawkeye record of 443 pounds in a hang clean established by Outland Trophy winner Brandon Scherff. Surrounded by teammates encouraging him and then celebrating his accomplishment, video of Wirfs’ record-setting lift went viral. It was a record Wirfs had been eying since arriving at Iowa. “Every day, I walked past the record board in the hall and saw it. It was something I really wanted, something I felt like I could do,’’ Wirfs said. Now he’s trying to take that to the field.